Sunset Drive-In | Flickr - Photo Sharing! 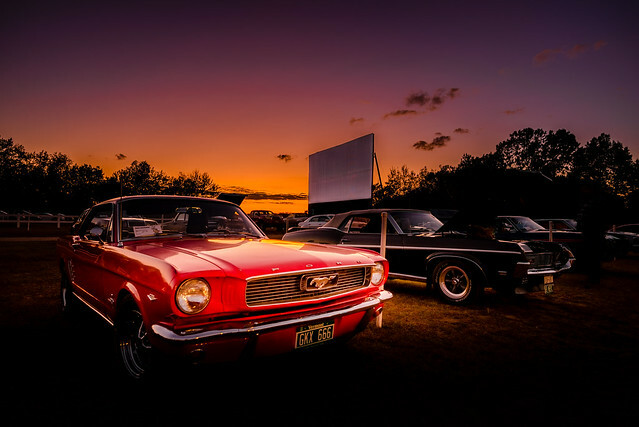 What classier can you get then classic cars at a Drive-In theater? Had a little car show at the Drive-In's last night and drove away with a top 5 trophy! So I screwed up this shot big time. I didn't focus on the Mustang, I was upset. It was just after the award ceremony and people were running back to their cars because it was getting chilly and I was just rushed so I messed up the focus but I thought it was a really cool cool picture and wanted to share it anyways. Sometimes we just mess up and that's okay. You can't always be perfect. creativegaz, yarindvash, and 80 other people added this photo to their favorites. That's lovely Nicholas. The light it great. Emily Broomhead Thanks Emily, yeah the light was pretty good. Not as intense as it usually is though! Great composition and colors! I love the theme of the classic cars at the drive-in! Admittedly I'm looking at this on a smartphone but honestly that focus looks fine on the Mustang, great job especially under the circumstances of the rushed situation. Nick Stanley Yeah it was really cool, I'd love for this place to have more car shows..it's only once a year. It's a shame they don't do more, but because it doesn't get dark during the summer until like 9:30pm so it's kind of pointless lol. a_radical_eye Yeah..you can't tell on a smartphone. However, the picture still tells the story and that's all that matters. Thanks man. Terrific lighting! Movie poster quality image. Pedalhead'71 Thank you man! I might need to get ahold of the Mustang owner. Haha. David Williams Thank you very much! Sweet shot! Classic cars and drive-ins go hand in hand. Not many left. Especially Mustangs with a 666 license plate. Musgrove and the Pumi Haha! Didn't even notice the license plate. Even better. Thanks for pointing that out! !